The first book in the Blue Ridge Library series and a new author for me. This is not the last book by this author as I will read her again. This is listed as a mystery but it is much more. There is a strong romance. A cold case that needed solving and an unusual motive for the murders. The characters are complex and descriptions will settle you into a mountain town’s feelings. I especially liked the cesspool scenes, both times. I deducted one star because I felt the plot has been used a number times. Amy Webber and Richard Muir join together to find an answer to how his Great-uncle, Paul Dassin die. Richard wants to prove his wife did not kill his uncle. As they searched archive records, two new murders occur. Both victims had ties to the to Paul. There are a number of suspects to keep you guessing. 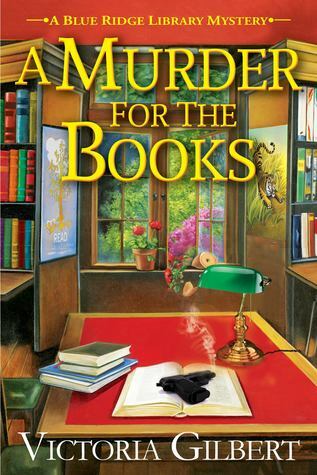 The murders and the cold are skillfully brought together as one. The closing part was hectic and I felt Any went through more than enough danger, some of it unnecessary. Disclosure: I received a free copy from Crooked Lane Books through NetGalley for an honest review. I would like to thank them for this opportunity to read and review this book. The opinions expressed are my own. This entry was posted in Books, Uncategorized and tagged Amy, Blue Ridge, cesspool, Cold Case, Favorite, mystery, romance, Victoria Gilbert. Bookmark the permalink. I’ve been eyeing up this one. Glad you liked it.